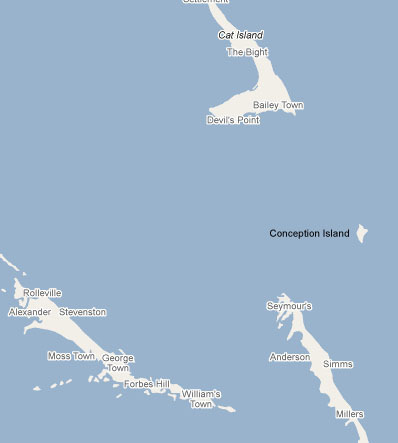 Conception Island is a two day sail away from George Town in the southern Bahamas. It is very small triangle of coral and sand and a day's sail from any other land. 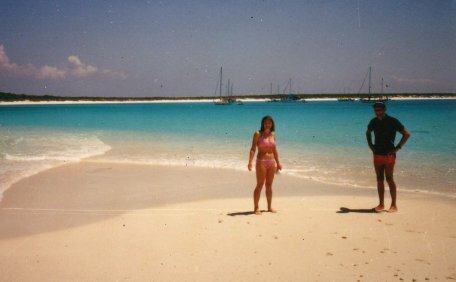 It has the most beautiful beach on one side and incredible coral reefs on the other. One cruising sailor told me I just had to go see the stag-horn coral off this island which are 40 feet tall with trunks as large as big trees. Motoring over the reefs was very exciting as the water is so clear and the reefs of coral so huge - like looking on the top of an enormous forest. The place to see the best coral is too far from the island by dinghy so I took the Contessa. The water was crystal clear and I could easily see the bottom in 50' of water. I chose the largest sandy patch I could find to drop the anchor into - it was about the size of a football field. The anchor set nicely and I let out a minimum of chain so as not to risk the chain getting near the coral. The anchor appeared to be holding well and the winds were light. I set off to explore the coral and was amazed by it. The stag-horn coral branches intertwine with such density it was almost difficult to swim among it, even 40' above the bottom. I noticed the current was quite strong, I hadn't thought there would be any way out here in the middle of nowhere. After a while I headed back to the boat - and found the anchor had dragged off the patch of sand and my chain now disappeared into the forest of gigantic coral. One thing I did not have to worry about was any damage to the coral as the branches were at least a few inches in diameter and there was no danger of breaking any of the coral. I could not see the anchor at the base of the coral and knew it would be futile to try to bring it up. Anyway, the chain had wrapped itself around branches of coral all the way down into the abyss. The current caused some pressure on the chain and I figured that would have to be relieved to untangle the chain. Luckily, my sister and mother were visiting, and I got my sister to motor the Contessa around in circles while my Mum and I would work with the chain and anchor from the dinghy. It was a big relief to get the anchor and chain back on the Contessa and we were happy sailing to the island with everything intact. We found snorkeling around the back of the island to be a fantastic experience in about 10'-20' of water.